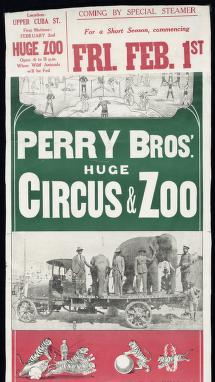 In 1929 the Perry Bros Circus and Zoo arrived in NZ and toured the country by train. In Wellington they set up camp at the top of Cuba St. Imagine that elephants and tigers in the CBD! The animals were kept in line by Captain Wizard the wild animal trainer and performing artists with fabulous names and entertainment options that drew in the local crowds. The Flying Dunbars, the Jingling Jumpers, Miss La La Selbinie the contortionists, Mulldoon & Freddie the clowns, Henry Arco Troupe with their balancing act, Miss Doreen the trapeze artist, Alva Zalva and Alva did somersaults and Ridiculous Gordon made the crowds laugh as he was a cycling comedian. 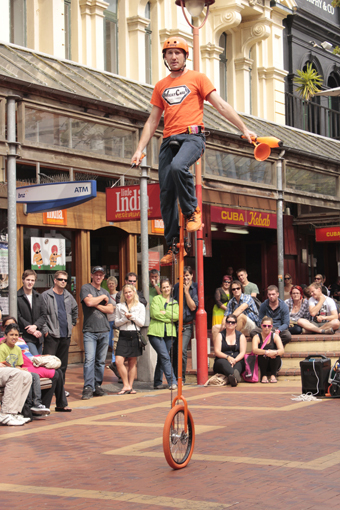 It’s great that today Cuba St still has acrobats and performing artists entertaining the locals and visitors to this creative quarter of Wellington. During summer we are lucky to have artists who use the mall as an open air stage. Though it seems these performers have to really sing for their supper. 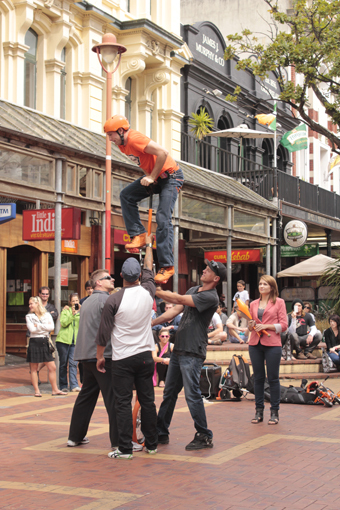 They offer the gathered crowds entertainment and ask at the conclusion to the show for people to put some coins into their hats. I have seen the majority of these crowds not even drop a 50 cent coin. I suspect that in 1929 people had to hand over the money to the Perry Bros circus before you could see the entertainment on offer. But times change and what worked as a business model yesterday does not necessarily work today. I am really looking forward to the International Festival opening this weekend, and of course the Fringe is happening right now. Thankfully a few free activities are on offer, I am sure they will be enjoyed by many . If you watch someone on the street performing think of the coins you toss into their hat as support for a self-employed artist but only the price of a coffee. 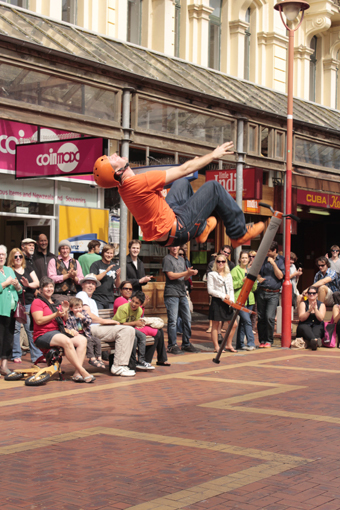 I hope that Cuba St in 20 years’ time still has a place where performers can entertain out in the open and that the changes that we will see in the street over the next 20 years are planned enough to incorporate some spaces for obscure entertainment indoors and out. Post script; re the elephants, I have been thinking that they have metaphorically migrated down to the bottom of Cuba St and are now residing in the council chamber. The elephants are starting to apply some pressure and will come out from hiding for discussion this could be one of the most important issues that the council and the city will need to deal with, earthquake prone buildings. Anyone living in Wellington knows about earthquakes. I have grown up in fear of how the ground can rock ‘n’ roll making the buildings I stand in shudder. Within minutes, I am known to quote my estimation of its size, depth and location. 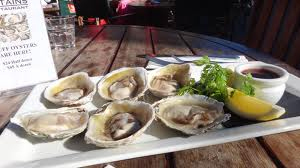 Had I been a resident of Christchurch, I would have left town as quickly as I could. 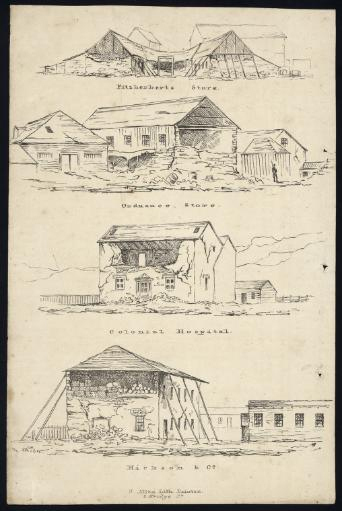 In 1848 the new residents of Wellington where rocked by a large 7.1 quake that knocked down over 70 buildings made of brick and sod. This was the majority of the townships’ buildings. One family of 3 died, crushed by bricks. Quakes continued to rattle the city for over a week. After this quake, a number of people left the city and moved into the regions, onto the Kapiti coast and into the Wairarapa. As timber buildings had withstood this large quake, the settlers rebuilt the town in timber and it wasn’t till the 1870’s that large masonry buildings started to be constructed. The large earthquake of 1855 estimated to be an 8.2, shook the towns wooden buildings violently; tumbling only chimneys. Most buildings withstood the shake because of their flexibility. The swamp at the Te Aro Pa and the swamp and lake in the Cambridge Terrace and Basin area were all drained of water. 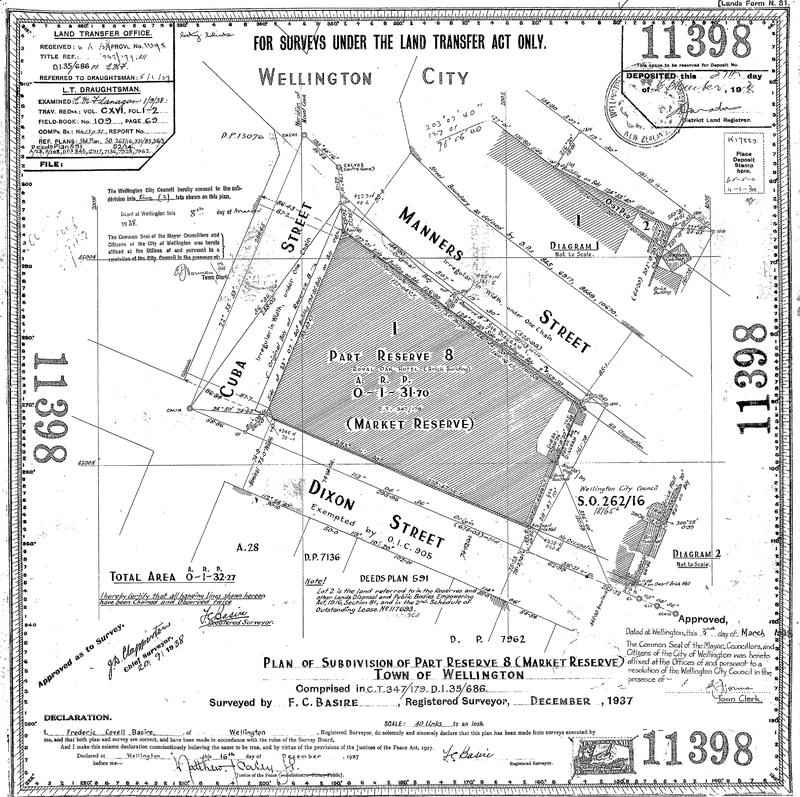 This land emergence greatly affected the residents of Te Aro. The Maori from the local Pa left soon after as their garden areas had disappeared. The land had risen by between 1 & 1.5 meters around the city shoreline. But out in Petone land rose by up to 2 meters. As most of the buildings were constructed of wood only 1 person died in the township when his brick house fell on him. 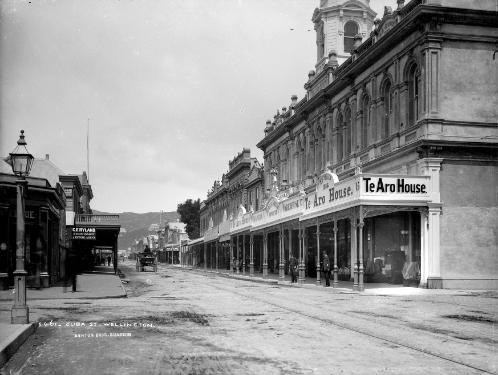 Cuba St was extended with more flat land as where other parts of the township. Wharves needed to be extended and this was the beginning of numerous reclamations that gave the locals more flat land to build on. 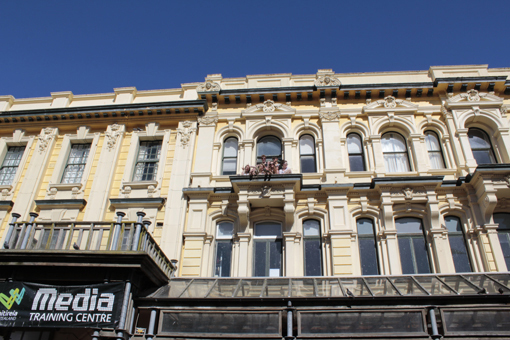 Today, 53 buildings in Cuba St have been identified as being potentially prone to earthquakes and 16 have had notice served from the council . This notice means that the owners have to strengthen the buildings in the next 10 years. Some of these buildings are so vulnerable that the landlords are required to strengthen or demolish the building in a shorter time frame. With this situation the architectural fabric of the street will change radically over the next decade. Many landlords will deem it too expensive to strengthen the buildings and decide to demolish and rebuild. Let’s hope these landlords can afford good architects to design new apartments, office spaces and shops so the new look will emerge with positive modernisation. Landlords who decide to retain the original structures will incur high costs; either way it will mean rents will skyrocket. Who will be able to afford these rents? Small boutique shops and cafes are so much a part of the current character of the street. These businesses will find it difficult to pay high rents. High St chain stores could well afford it, but Wellington does not seem large enough to have more retail outlets of this type. Lambton Quay businesses find it hard enough now. People have the right to be safe in the buildings they rent from landlords. 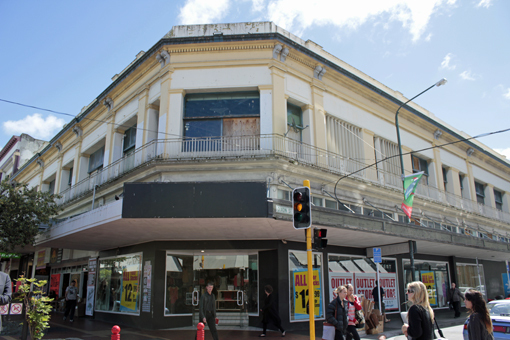 Will more people be moving their premises out of Cuba Street? After the recent large quake felt in November, Weltec who have classrooms in the Old Working Mans Club in the mall, decided to end the term early and none of their students or teachers are allowed back in the building. I suspect they are on the lookout for new space before the next term starts. 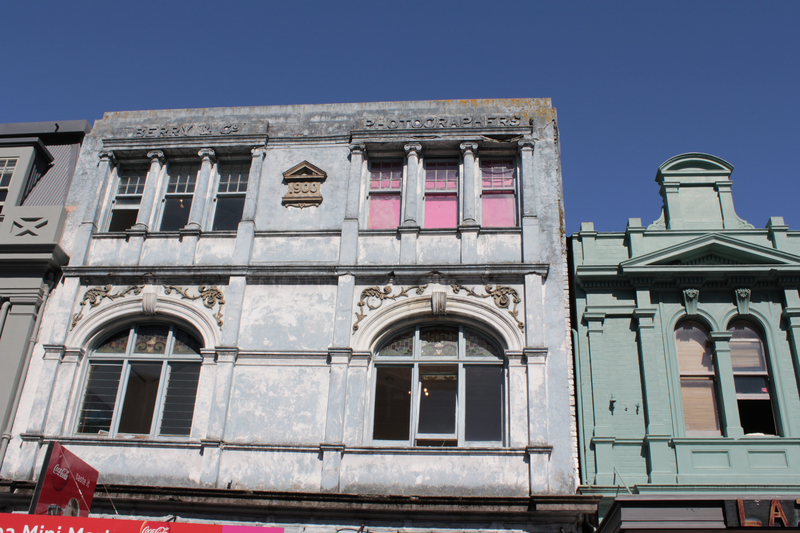 Cuba St has been a place to shop right from its beginning. 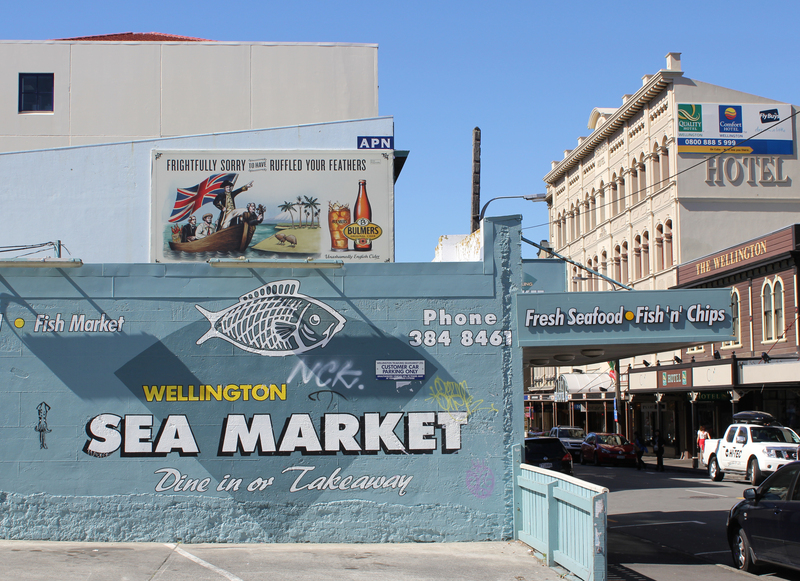 The first trading post was built in 1841, near the corner of Manners St and Cuba St. Captain Rhodes built a whole complex, home, shop and warehouse and the very first wharf in Te Aro. The locals could use the wharf free of charge. Well he must have been an interesting character. Being a ship’s captain he was knowledgable about getting supplies for the shop and by allowing the people to use the wharf he was a savvy shopkeeper and developed a following of loyal client’s. By the 1870’s there where shops up the whole street, which at that time started at Manners St. The butcher the baker and the candlestick maker could all be found offering services to the hardy settlers. Dress shops didn’t so much as sell the ready-made dresses that we require today, but they did supply the bolts of fabric, cotton and thread required for the good woman of Wellington to make the dress they wanted. Mind you so much fabric required! just think of how many hours of labour it would take to produce that layered look of skirt. 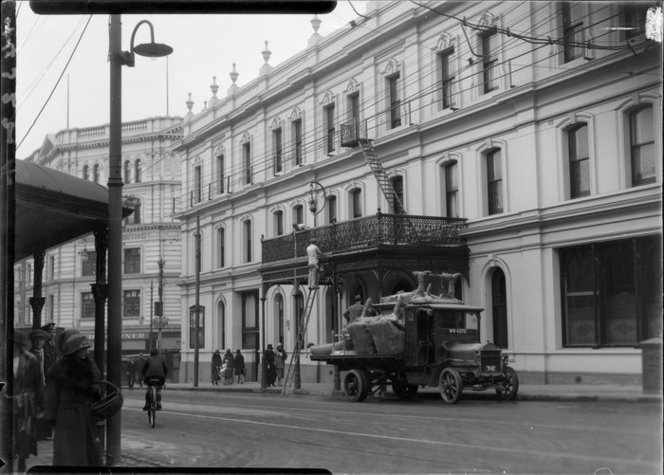 If you didn’t have a bloke with a horse and cart, it was more than likely you owned only two or three dresses and would have to of maneuvered yourself about in the dirt of Cuba St ( that would turn to mud in a flash when it rained) being careful not to drag your hem in the mud. Oh the stress of it all, the washing took forever, and if you lived up Cuba St or near about in Te Aro you where probably working in a Thorndon household, doing the lady of the house washing. By the 1870’s. 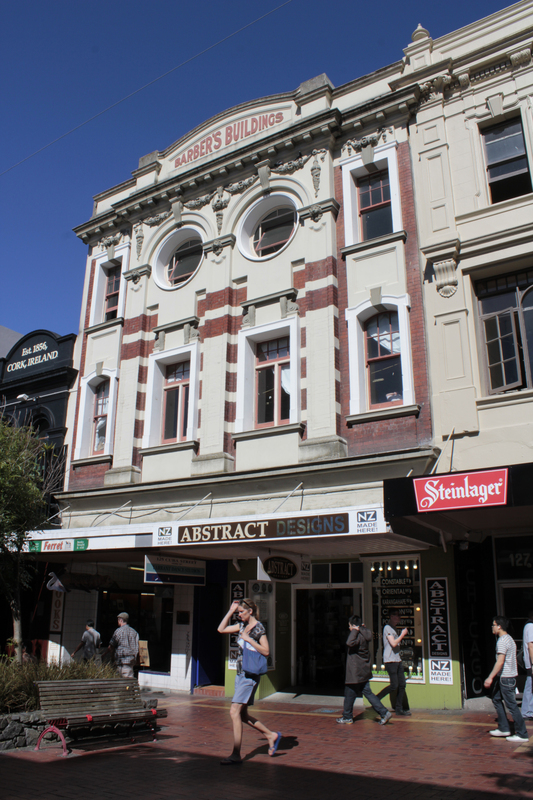 retailers that are still with us today including Kirkaldies and Stains had opened a branch in Cuba St. 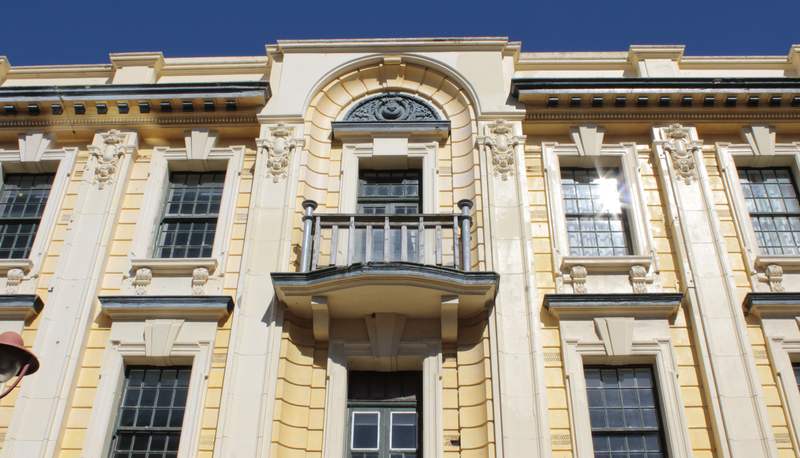 The first James Smiths was located in Te Aro House so those ladies with a few extra pennies, could buy that special best dress and attend the occasional social function. Te Aro House soon to be demolished, this is what remains of the 3rd building built on this site called Te Aro House image below. 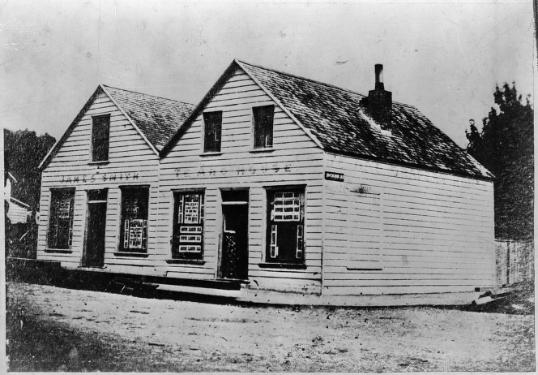 The original drapery store built 1840 a wooden building then James Smiths constructed another store in 1888.